R. Madhavan is one of the very few decent individuals in Bollywood. He keeps to himself and does not make a huge show of his celebrity status. He is hardly known to be hitting back to the trolls. But not this time. 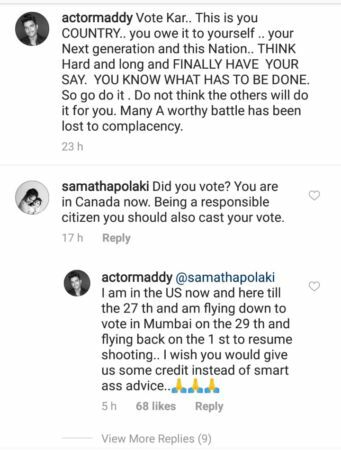 In one of Maddy’s recent Instagram posts where he was asking people to go ahead and vote, a troll blasted him for being abroad and not being available for casting his vote. 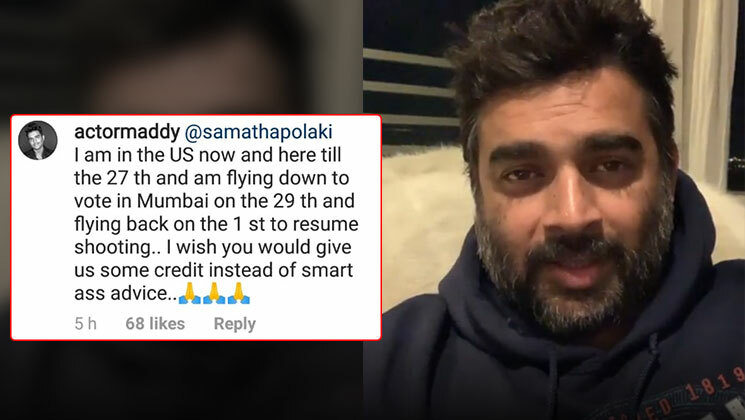 Now, this is a really nice message from Madhavan. But as we all know, celebrities end up getting trolled come what may. Maddy too was slammed by many who questioned why he was addressing people in Hindi and not in Tamil. However, it was one troll who pissed Madhavan. Kudos to you Madhavan for giving it back to the troll. Also, you flying back to India just to cast your vote is one of the best gestures anyone can do in the name of patriotism.